September already! That means the year will be 3/4 of the way over in just a few weeks! I always feel like a year is such a long time, and have all these plans for change and how different my life will look after another trip around the sun, but it seems to stay mundanely the same. Maybe it's just that it's hard to notice change when we're still so close to it. Maybe there's not much to notice. But, anyways, there's still plenty of books I want to read before the year comes to a close, so let's get on to that. 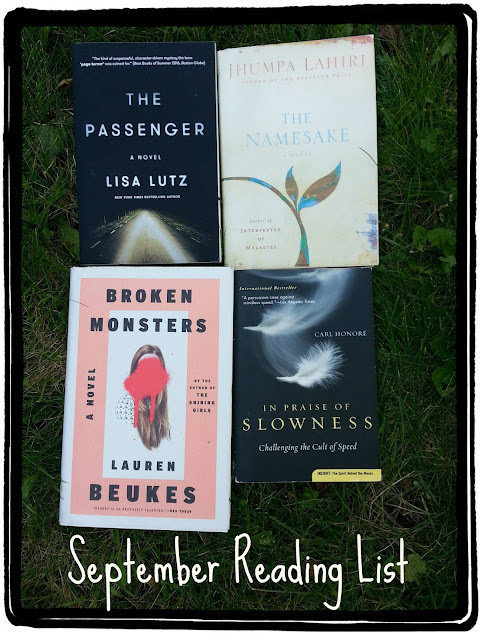 The Passenger by Lisa Lutz had been on wish list, and I received it for a birthday present back in February. I honestly can't remember which blog reviewed it, that made me want to add it to my wishlist, but it's languished on my shelf for over half a year now, and it seemed like it was time to give it a read. I'm actually reading this one right now, and am enjoying it. The Namesake by Jhumpa Lahiri has been on my shelf for years! Years! It's time to either read it or pass it on. In Praise of Slowness by Carl Honore is a nonfiction read. I listened to a TED Talk Honore did on slowing down, after I had found this book at the thrift store. I found it intriguing, but never got around to reading it. Broken Monsters by Lauren Beukes is by the same author as The Shining Girls. I'm hoping for a little less gore, but I'm not holding my breath. I see someone on Goodreads describe Beukes still as paranormal crime noir, and while that sounds like a mouthful, it also seems accurate. I don't know how I'm going to feel about this one. The Shining Girls definitely held my interest, and I read it fast, but if I hadn't bought this one before I read the other, I'm not sure I would have brought it home with me. That seems contrary, but it makes sense in my head. So, that's what I'm hoping to get through this month. What's on your reading list? Or do you have any insight to offer into any of the books on my list? Let me know. I'm reading Steve McQueen:The Salvation of an American Icon by Greg Laurie.